Head coach David Quinn did not mince words in his press conference following the No. 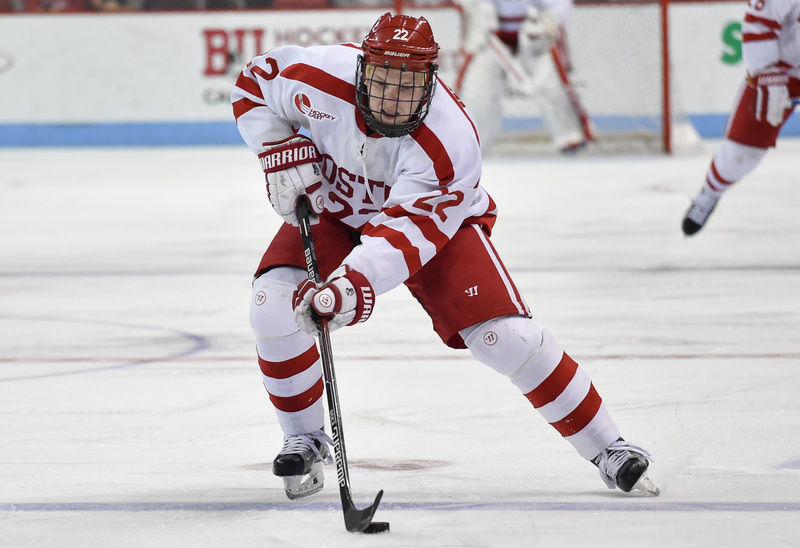 11 Boston University men’s hockey team’s loss to the University of Vermont on Friday. “Just really disappointed with our performance tonight,” he said. The Terriers (7-5-3, 3-3-2 Hockey East) started the game strong, but were quickly “deflated” by a first-period injury to sophomore forward Nikolas Olsson and a power-play goal by the Catamounts (4-9-2, 3-4-2 Hockey East). BU was unable to recover, according to Quinn, and was outplayed as Vermont came away with the 4-2 win. Here’s what we thought looked good and bad in this edition of pluses and minuses. Junior forward Tommy Kelley has now matched his game total from last year after playing in his fourth contest of the season on Friday night, only he has one more goal to show for it this time around. Though the Terriers ended up losing to UVM, Kelley got BU on the board first 8:41 into the opening frame. He received a pass from sophomore defenseman Brandon Fortunato at the center point and let it rip. The puck whizzed through slot to the back of the net and beat netminder Mike Santaguida for his first goal since Dec. 6, 2013. “It’s always nice to see a guy get his first goal of the season, his first goal in a while and I was happy for him,” Quinn said. Kelley has played in three straight games for the Terriers now after impressing Quinn in BU’s 3-0 win over Bentley on Nov. 24. Shameless plug: If BU fans need some feel-good reading after this game, I wrote a story in October about Kelley and his sister, Mary Grace, who plays for the women’s team at BU. The Catamounts tote four former Terriers or former Terrier commits on their roster in defensemen Alexx Privitera and Ori Abramson and forwards Jarrid Privitera and Liam Coughlin, each of whom had at least a point in BU’s loss. To read more about their Friday night successes, read Sarah’s sider. In the middle of the first period, Olsson appeared to hurt himself after being involved in a hit by the Vermont bench. On his way back to the BU bench, though, he threw another hit before exiting down the tunnel with an obvious injury. He did not return to action and instead sat with the healthy scratches for the rest of the game with his left arm in a sling. Olsson had just returned to play for the Terriers on Saturday after missing four games with an upper-body injury. Friday was his second game back. Though it had four opportunities with the man advantage, BU was unable to capitalize on any of its power-play chances on Friday, testing Santaguida six times. The Terriers are one for their last 13 on the power play dating back to their 4-2 loss to the No. 12 University of Michigan on Nov. 21. Quinn added that his team played with “complete lack of emotion” and failed to showcase any passion or enthusiasm, noting that “you’ve not no chance” when those things are missing from your game. Hi Judy. I love that article you wrote about the Kelley kids! Tonight was a dreadful game … but we should all be happy for Tommy’s progression. No Excuses for that disgraceful performance. They looked more like a figure skating team than a hockey team! Yea, Joe, the D has really let us down. They were to be the best in college hockey. WE just can’t seem to get enough quality forwards despite what seems to be a great recruiting team. Wait ’till next year as they say in baseball. May be the Beanpot. That would be the best possible hope for us now. As bad as we were the difference in the game was the PP. They got one goal and we got 0. Bad turn overs all night and our number 1 line was not there last night. Looked like i was watching the 2nd BU VS MICH game all over again…If not for a great game by Maguire this one could have been a 6-2 game. BU Hockey 7, This hurts but I agree with your assessment of last nights fiasco. It was horrible Larry,and although we disagree on much,I never intend to insult you,never.I am very passionate about sports and sometimes type before I think,no disrespect meant at all.And I apologize if you took it that way,we both want BU to do well.And latest news about Nick,he is done for the season…..Enjoy your Holiday season. Joe, the problem is that they did not learn from their mistakes and continue to make them. In college hockey and more specifically Hockey East hard work trumps talent on most nights. Son of CC, It is not a talent issue but a chemistry and communication problem. Instead of playing as a team they play as individuals. Not a smart team, the same mistakes game after game. The failure to play 60 minutes finally caught up with them. Ozzie, It might have been close on the scoreboard but Vermont clearly controlled the majority of the game and were the better team. They earned the victory by simply playing harder, tougher and more disciplined than B.U. I’m gonna throw something out there….I usually just read and keep quiet on here but I’m noticing a pattern here….lack of effort, lethargic, sloppy…..I wonder if these kids are not conditioned as well as last years team? I mean same coaching staff (minus greely) same team (minus the Big E which I knew goals would be harder to come by without, but this hard??) but the big difference is NEW conditioning coach……….. Guest 17, It has nothing to do with conditioning as there have been many 3rd period comebacks including a goal that tied the game in the third last night. The big difference between the two teams is # 9. From what I understand,the conditioning Coach worked primarily in the NHL,last with the Anaheim Ducks I think,I don’t think conditioning is an issue at all,especially under Quinn.I think it’s a lack of leadership on the ice,and not playing as a team. deplorable game. VT had 3 wins. everyone associated with this program needs to take a good hard look in the mirror, especially the coach. the team played selfish (guys trying to go end to end. hey #1 draft pick, McAvoy… you are not Bobby Orr), unenthusiastic hockey. so far, he is a very good recruiter, but the coaching part remains to be seen. first, he has handed garbage – not his fault. second year, he was handed eichel who bailed the team out time and time again. this year…..
finally, we are slowing digging ourselves into a pairwise hole that might make not qualifying for the ncaa’s a foregone conclusion by february. and i don’t think it is too much to expect a name brand program like BU to qualify for the 16 team tournament. Vincent,you have it absolutely right.I don’t know what the problem is,they don’t seem to be playing like a team.Individual efforts,are just not going to do anything in a league -that I believe is the most talented and competitive in all of D-1 Hockey-Hockey East.Hoping the second half is improved dramatically. B.U. Hockey 7,no need to apologize. I am as passionate as you and take losses much too seriously. One year when B.U lost in the frozen four the players on the team had to console me. I still have nightmares form last years final ! I have no explanation for this weekend. I am great full for the victory today. If this continues the the NCAA tournament is a dream. Hope Patriots rebound tomorrow. I never blame the zebras but the last game was ridiculous. I have a horrible feeling that this is not the last of the marginal calls going against them. I hope I am wrong. Guest 17, Of course it is only my opinion. I am not an expert. However after 50 years of watching B.U. Hockey, Jack Eichel would be on top of my list as the best player. In the same league with Ken Dryden and Paul Karrya. B.U. Hockey 7, was the news on Nick announced or do you have an inside source? If he is off the team can B. U. find a recruit to come in second semester? Larry,not off the team,but will not play this season….That is all I know. Larry – listen to Quinn’s answer to the last question during Saturday’s post-game interview. Hi Larry. Quinn addressed that question (Roberto) at the very end of Saturday’s post-game interview. Re: Roberto, someone asked about whether he’d be available for Saturday’s game. Coach Quinn said “maybe.” That’s the last mention of Roberto in a press setting. Absolutely no indication from Coach Quinn or anyone reputable yet that he’s off the team. Thank you for replying. I played the press interview three times and no mention of Roberto. Was there another interview that a I missed ? Why no reputable information on Roberto. Has he joined the CIA or FBI ? I cannot imagine that it would change the world if we knew more info. There are plenty of rumors swirling, but nothing we can confirm. We won’t report anything unless it’s confirmed by the team or any other reputable source. Vincent, amen brother I could not have expressed my feelings about the current state of the B.U. Hockey any better than you. Realistically, I am disappointed with the overall results to date. Remember the seniors from the 2008-2009 NCAA Champs team were considered an average at best recruiting class, certainly not in the top ten by most talent evaluators. Guest 22, In my opinion B.U.s best period this year to date has been the third which I attribute to superior conditioning. It certainly was the case against Cornell and in the second game against Vermont. Guest 22 the two problems that bother me the most are the amount of stupid penalties and the constant forced and unforced defensive turnovers that end up in the back of the B.U. net. All three goals on Saturday were ridiculous defensive lapses that should not constantly occur at this level of college hockey. Glen, he addressed it but gave you no information. WHY ? Sarah, Thank you for continuing to pursue the subject. It must be very frustrating not to receive any accurate information. The coach is certainly not making you job any easier. This is one area that I totally disagree with his approach. More transparency and less rhetoric would certainly stop the rumors. I do not understand this cloak and dagger mentality. BU Hockey 7 Sorry about the Pats. I could not believe what I was seeing,. A bad day at the office but I am concerned. Tough to criticize a team that has lost two games in a year. Never the less shocking to see them give away three touchdowns and 35 points in a row. I believe you about Nick I want someone to make it official so everyone can move on. I hope Gronk returns sooner rather than later. He would have helped yesterday. All around bad weekend Larry,like they say,any given Sunday! !I’m not worried about my Patriots,I wish I could say the same for my TERRIERS,but am hoping for a good second half!Fingers crossed! I think there might be confidentiality issues with regard to the status of Roberto. Maybe that’s why we don’t know much. I am wondering if it’s a matter of Roberto having to satisfy some condition (take a particular action … which may or may not happen) for him to be reinstated in the line-up. Quinn said maybe and based on how I interpreted his facial gesture, I think there’s a reasonable chance of getting him back. Gosh, we could really use him. As far as Liam C., I think he decommitted from our program because BU wanted him to come in next season (not this season). Sarah, is that right? Glenn, According to B.U. Hockey 7, Nick is not coming back this season. I have no reason not to believe him. If this is true I believe his status should be updated. I am just asking for an explanation without giving away state secrets. I could be wrong but I am unaware of any confidentially issues unless B.U. created new ones which is always possible. Right now we are getting thin on players. Short on goal scoring and we never replaced MAX. Any news on bring a player in for the 2nd half? B.U. Hockey, I am concerned about both teams. Especially the Patriots going into enemy territory with former players and ex coaches that want to prove a point to their old mentor. I lowered my expectations for the B.U. Hockey team. I am scared this weekend as the depth is thin and they face two quality opponents on the road. Their schedule does not get any easier next semester and they may end up on the road for the second round of the Hockey East Playoffs. Also the NCAA tournament is in jeopardy. Amazing,I agree with everything you have said about the program this year,except for the mocking of the Coach,and Vincent doing the same.Everyone is entitled to speak whatever is on thier mind,or type,but I think the major problem is Grizz being hurt,major disappointment in the talent of the Freshman class,or lack thereof.Throwing shots at the coach is everyones right,but I think completely wrong,THREE coaches have won thier first 3 NCAA games,Quinn is one.Jack was great last year,but 1 player doesn’t make a Team..HOW quickly everyone has forgotten that job he did last year with some TALENT,That is what this team is missing,just my opinion. I admit that I am critical of the coach and do not apologize for my perspective. However I do respect your opinion even if it is different . The former coach from North Dakota Dave Haskntoll made the Frozen Four seven times in eleven years and won zero trophies. The B.U. team had a great run last year and your coach did an admiral job. I even told him so to his face. Unfortunately he did not have a great first year and unfortunately that is also part of his record. I agree that one player does not make a team unless he is generational. Jack was that player and in my opinion the major difference between last year and this year. I am not disappointed with the Freshman as I am with the returning players and upper class men. No doubt,Jack was a generational player,and he isn’t my coach,lol-I haven’t skated in 40 yrs!I thought he was the teams coach,everyone is entitled to their own opinion,as are you.But it seems like the 1st year he was here,talent was awful,2nd yr,much better and were in the Frozen Four,didn’t take home the big one,and I believe there are 2 simple reasons,Eichel was shut down by PC,And the O’C goal completely turned momentum and play into PC’s hands,but that is sports,it happens.This years team is a little shy on talent,(have not shown it yet anyway)and I believe the injuries are taking its toll,last year-plenty of fresh healthy players in the stands,I could always spot them from my box.But most of all,an ON ICE LEADER like E-Rod,or Hohman(sp),Grizzy is a great player/captain/leader,but obviously it is not a constant this season.And Jack Parker was here 40 years and won 3 championship titles,NOT COMPARING THEM AT ALL,it would be foolish,but I firmly believe this current coach will bring the big one back to BU,and if the NHL doesn’t scoop him away,maybe,just maybe more than one…. I have enjoyed our discussion. I am no expert but B.U.s incoming freshman was highly ranked. The college hockey prognosticators had B.U. as a top five team.In reality I do not know if B.U. is a top five team in its on conference. Injuries are a factor but are part of the game. I am very disappointed by the teams first half performance. The inconsistent play ,constant turnovers and awful power play are my primary complaints. So sorry no I have not changed my opinion on the coach. Thank you for the clarification. I misunderstood you comments and thought he left the team. A vey confusing situation that apparently will not be clarified by those in power. I cannot be to excited until after the incoming freshman actually put on the uniform and play a game. Also the team was badly hurt this year by players leaving the program early , transferring ,deciding at the last minute not to enroll in one case being denied admission. I know you are a fan of the coach but I believe the he must take owner ship of the present state of the roster and the first semester results. I am especially concerned this weekend. I hope I am pleasantly surprised.